Is life meaningless until we give it meaning ? From the scriptures that Srila Prabhupada brought to America, we learn that as humans we are meant to delve into higher realms of thought – to understand the soul’s journey through life and to its ultimate destination. Spiritual purpose extends beyond our journey on the material plane. It involves our connection with the source of our divine nature, the Supreme Person, our eternal loving father. To illustrate this point, Srila Prabhupada often gave the example of a lost boy looking for his father. No matter what material arrangements we may make for the child’s safety and well-being, no matter how much we lavish him with material riches or possessions, he will be happy only when he is reunited with his father. In the same way, we are separated from our original father, Krishna , trying to find solace in the temporary pleasures of this world. Only when we find Him and connect with Him in love will we taste happiness that truly fulfills us. Srila Prabhupada emphasized how love for God is inherent within us. We are parts of Krishna , and although we are infinitesimal and He is unlimited, we cannot be separated from Him, the source of our existence – just as sunrays cannot be separated from the resplendent sun. Our position as His servants increases our brilliance, and if we turn away from Him, we will feel empty and incomplete. Srila Prabhupada explained that we are like patients suffering from amnesia. Chanting Krishna ’s holy names will cure the forgetfulness of our relationship with Krishna and remove from our heart undesirable traces of dirt that cloud our love for Him. When we purify our mind and consciousness by chanting Krishna ’s sublime names, we realize who we are and where we belong. We accelerate our spiritual journey. 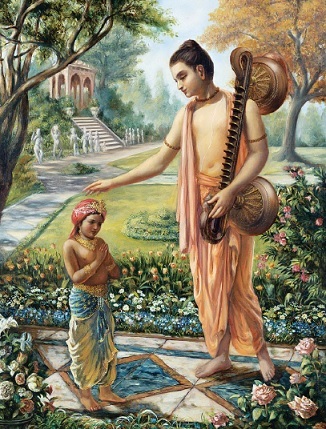 The Srimad-Bhagavatam relates the true story of a young prince who, though seeking the approval and favor of his earthly father, received the audience of his eternal father. Five-year-old Dhruva was enraged when his envious stepmother insulted him for trying to sit on his father’s lap. Dhruva was even more infuriated when he watched his father favor his half-brother and stepmother. Intent on revenge and material success, on his mother’s advice he decided to leave home to seek Lord Visnu. His life’s meaning and objective were clear to him. He wanted to attain a position greater than that of Lord Brahma, the creator of the universe. By fasting and performing arduous austerities, Dhruva strictly followed the instructions of his guru. His determination to win the Lord’s favor was so intense that at the end of six months Lord Visnu appeared and made him king of the polestar, which far exceeds the opulence and grandeur of any other planet. Srila Prabhupada succeeded in uniting all kinds of people with the common purpose of finding their way back to Krishna . Clearly, Srila Prabhupada’s selfless actions and sacrifices to awaken people from their amnesia-like condition stemmed from his pure love for Krishna . From that spotless love arose compassion for his brothers and sisters and eagerness to direct them to their eternal father. Back to Godhead. He felt an urgency to reveal life’s ultimate purpose of going back to Godhead, our eternal home. Turning back to God is the sole purpose of human existence, he stressed. And the motto he chose for the cover of the magazine showed that “Godhead” is also a state of consciousness: Godhead is light. Nescience is darkness. Where there is Godhead there is no nescience. Nikunja Vilasini Devi Dasi, a disciple of His Holiness Giriraja Swami, lives with her husband and two children in Durban, South Africa.